A memorable TV commercial for Vicks cough syrup in the 1980s opened with soap-opera actor Peter Bergman, known to millions of "All My Children" fans as Dr. Cliff Warner, telling viewers: "I'm not a doctor, but I play one on TV." Bryan Cranston isn't a quadriplegic, but he plays one in a new movie, and that seems to have put a bunch of people's noses out of joint. 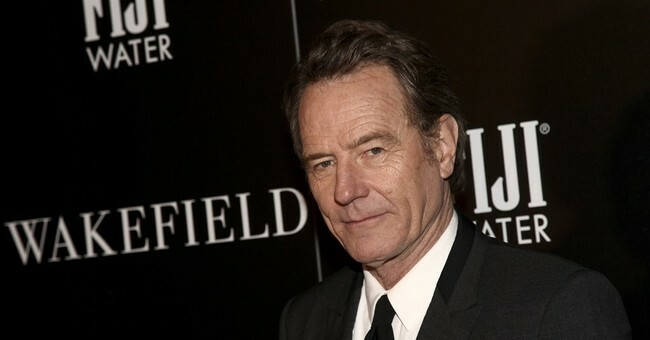 Cranston, who stars in "The Upside," has been taking flak for accepting the role of Phillip Lacasse, a billionaire left paralyzed after a paragliding accident. Cranston's detractors are offended that an actor who isn't really disabled would have the effrontery to portray one on the screen, instead of declining the job so the part could be played by an actor who actually is paralyzed. An irrational objection? Vice Media doesn't think so. On its website Thursday it blasted the actor in a piece headlined "Bryan Cranston Advocated for Disabled Actors While Taking a Role from One." Though Cranston has been outspoken in urging Hollywood to employ more actors with disabilities, Vice dismissed him as a hypocrite: "His decision to play Lacasse," it intoned, "has also prevented a lesser-known disabled actor from getting the opportunity to play the role and gain celebrity." This critique has been bubbling up for a while. When "The Upside" was making the rounds of film festivals, the respected Ruderman Family Foundation, which promotes the inclusion of people with disabilities, censured the casting of an able-bodied actor to play a paralyzed character as "highly problematic" and "discrimination." Dominick Evans, a filmmaker and activist who suffers from spinal muscular atrophy, chided Cranston for "tak[ing] economic opportunities away from disabled actors who work on average five days a year." As someone who uses a wheelchair, tweeted Evans last week, "I could never play Bryan Cranston, so why the hell can he play someone like me?!" The answer, of course, is: because that's what actors do. They play parts. They depict characters. They portray men and women (or, for that matter, amphibians and robots and monsters) whose personalities, experiences, and characteristics may be entirely alien to their own. The greatest actors are those whose performances are so believable and three-dimensional, so intuitive and perceptive, that those who see them forget they are watching an actor. As one theater critic, Susannah Clapp of the Observer, has put it, the most superb actors are those "who appear not to perform but transmit." Identity politics and the entitlement mindset already infect so much of contemporary culture, from law to academia to the arts. Perhaps it was inevitable that, sooner or later, they would undermine the acting profession. Scarlett Johansson came under fire last year when she agreed to star in "Rub & Tug," a film about a transgender brothel owner, Dante Gill. Tilda Swinton was blasted for playing the Ancient One in "Doctor Strange," a role adapted from a character that was Asian in the original Marvel comic. Disney has been condemned for picking Jack Whitehall, a straight actor, to play a "campy gay man" in the adventure comedy "Jungle Cruise." Latina magazine rebuked moviemakers for filling Hispanic roles in at least 13 movies with non-Hispanic actors. The likely effect of such criticism will be to kill movies before they can be made or to browbeat actors into disqualifying themselves from whole categories of scripts. The backlash against Johansson prompted her to give up the Gill role, which may mean the film is scrapped altogether. Darren Criss (who won Emmy and Golden Globe awards for his TV portrayal of gay killer Andrew Cunanan) announced in December that he will no longer play LGBT characters because he doesn't to be "another straight boy taking a gay man's role." Hypersensitivity and the assault on cultural appropriation have been wreaking havoc in contexts as varied as art exhibits, burrito shops, fashion shows, and musical performances. Their chilling effect on college campuses has been especially notorious. But those who wax wroth when actors play characters of a race, sexuality, or body type that doesn't match their own aren't merely challenging particular casting decisions. They are attacking the idea of acting itself. To insist that only actors who are X be tapped to play characters who are X is to insist that acting can never be more than skin deep. It is to declare that the extraordinary artistry and talent of great actors — their power to embody a role and bring it to life — must be restricted at all times to rigid classifications of race, gender, and whatever other categories the commissars of political correctness deem inviolable. It is to tell performers to stay in their own narrow lanes, to stick to characters just like themselves, and under no circumstances to transmit experiences and truths that they don't know from their own lives. "I'm not a doctor, but I play one on TV" wasn't just an advertising trope. It expressed, in a sense, the raison d'etre of the dramatic arts. Bryan Cranston wasn't a crystal-meth lord in real life, but he played one brilliantly in "Breaking Bad." He isn't a quadriplegic, either. Why should anyone want that to keep him from doing his job?